The Direct Blinds’ sample department is where many of our customers begin their journey. The perfect blinds transform not just your windows, but the entire look and ambience of your home or working environment. 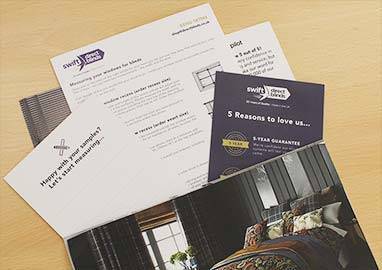 We provide free fabric samples for our entire product range, despatched to you by first class post, on the same working day for orders placed before 4pm. Every fabric and colour is unique, and therefore should be seen and touched before you purchase blinds or curtains. This is particularly important if you are wanting a close colour match as there can be variances in colour between screens and devices. Browse our website for your ideal fabric. You can use the filters to help select the style, performance and colour. Read our blog if you need a bit of inspiration. When you see products that you like, click on the “Get a Sample” button. Proceed into the basket, check your list of the free samples and proceed to checkout where you will be asked to enter your address. You can order up to ten samples that will be delivered to your door free of charge. When your samples arrive, spend a bit of time looking and feeling the fabric to ensure these are right for you. Put it against the window, decide if the colours match the design of your space including sofas, furniture, cushions or wallpapers. Be certain about your choice of blinds or curtains. If you are ready to order, read our detailed guide on measuring your windows. As a member of the British Blinds and Shutters Association (BBSA) we are proud to provide quality fabrics and systems that will last the test of time. We have over 45 years of expertise in producing high-quality blinds and curtains. All our blinds are manufactured in and tested to ensure the highest standard of products. The vast majority of our finished blind products are made in our own Yorkshire factories using hardware systems manufactured in the UK. Our customer services team is here to help. Direct Blinds has a team of knowledgeable experts who are here to help and answer your questions.